Great website and brilliant shed, I can always get everything I need and its worth a visit to spend my pocket money. If Brian hasn't got it, he will get it for me or my falconer. Brian says 'Confused'? 'Don't be, George is a male Harris....with great taste and sharp talons'....ouch! The steel safety rule is longer than 1" surely? You going to the Eridge show Brian :).................Hey Paul - should have gone to Specsavers!! Starting our own falconry business soon and will definately be buying from here!! Hilarious to read as well, not very professional to be laughing while sourcing supplies, but much more interesting!! 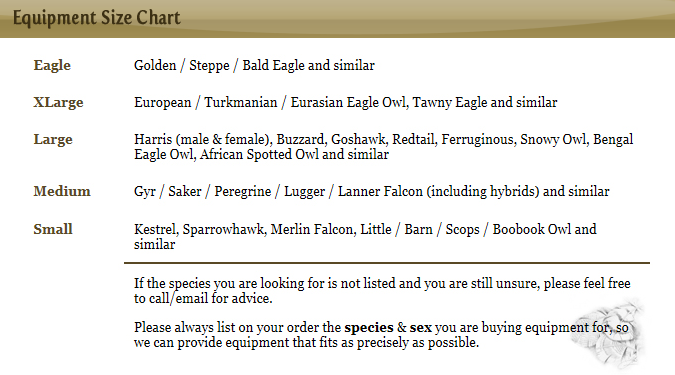 This is probably the clearest and best organised falconry supplies website I've found. It's also highly entertaining and a pleasure to browse through. It even has equipment specially for the greatest of hawks - the 'double-hard' redtail! Love it! Brian's shed is the dobermans danglers, this man is a legend, if you don't shop with him already you're mad!!! The glove I ordered for my daugher arrived last week in plenty of time for Christmas. It is beautiful and she is going to love it! Thank you so much for an organized, well-stocked, easy-to-navigate website. A resource like this is invaluable. Every transaction has arrived on time and above expectations. I also value that you are flexible with shipping destinations. Its a pleasure to shop here and plan to keep coming back. Many thanks!!! Hi Brian it was nice meeting you last Saturday.Your equipment was of such a high standard, I spent more than i was going to but I will be back very soon. It is like an Aladdins cave, and thankyou for your advice see you soon. Bill. Hi Brian. I'm considering becoming a falconer & I found your site very helpful and enjoyable.It's clear to me that the falconry community is close knit & friendly and I hope that I may be worthy to one day be part of it. This is the best falconry supplies website I have found. The prices are always the cheapest, the equipment is always the best quality, and you can get things on here that you can't get anywhere else! And everything is delivered cheaply and quickly! What more can you ask for? i'D JUST LIKE TO SAY THIS IS THE MOST ENTERTAINING FALCONRY WEBSITE I'VE SEEN BY FAR! ALSO GREAT QUALITY STUFF AT GREAT PRICES AND WITH THIS SITE YOU GET THE TRUTH ABOUT WHAT YOU'RE BUYING!! This website is the bees knees, amazing quality furniture for great prices. That piece of music at start on home page, is beautiful, where's it from? Answer.....Hi Ben, the music is from a private music library and not generally available. Got to be the best equipment and service money can buy, delivery time is superb! Brian's ok as well....ha ha! Hi Brian, Just wanted to say your service was excellent really pleased with products and have added you to my favourites, Atb Derry.